So I got a new job. Instead of riding to the wonders of Chatswood every day, I now get to ride to the delights of Silverwater (oh yes, I work in the most glamorous places). Distance-wise it’s pretty much the same as before, but it’s a rather different ride, divided into three quite distinct sections. The first section is nasty. 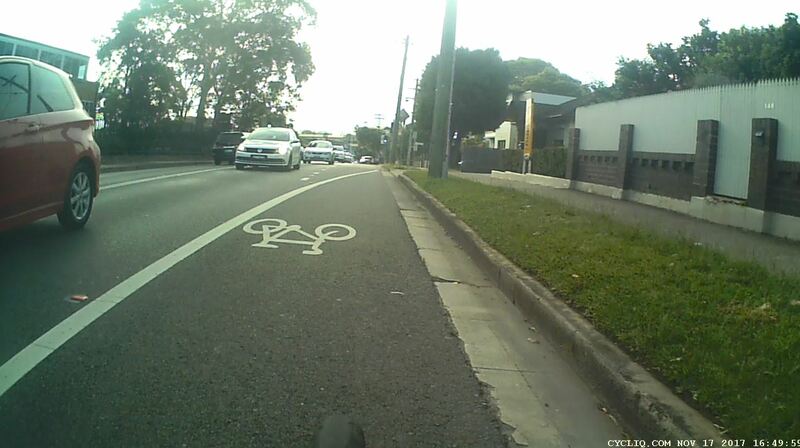 It’s a narrow, single-lane road which features cycle lanes on either side. The council, however, for some unknown reason allow parking in the cycle lanes. So they are not cycle lanes at all; rather they are a parking area that rapidly fills up. This means you have that dilemma of riding in the door zone and having vehicles squeeze by, or taking the lane and having them harass you from behind. 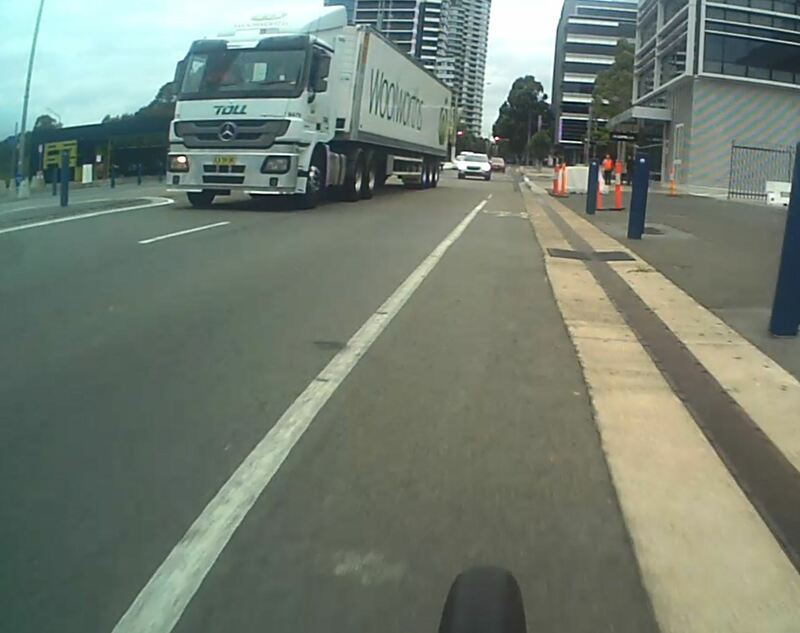 The bicycle symbols painted in the parking area don’t help either, as as soon as there is a tiny gap (eg a couple of cars long), drivers expect you to magically be riding in it – notwithstanding the fact that there’s no way they could overtake me before I reached the end of the gap. It’s a place where I have already experienced a number of very close passes. At some point, I guess I’ll take them to the cops. Not that they care. I think I’m going to have to find an alternative for this stretch, although there’s no obvious route I can see that’s going to be any better. The second section is much improved. The road widens out, there’s a good shoulder for much of it, dual lanes for the rest and the traffic is lighter and better behaved. This is OK. Of course, I’d like an off-road solution really, but for a confident cyclists it’s quite manageable. 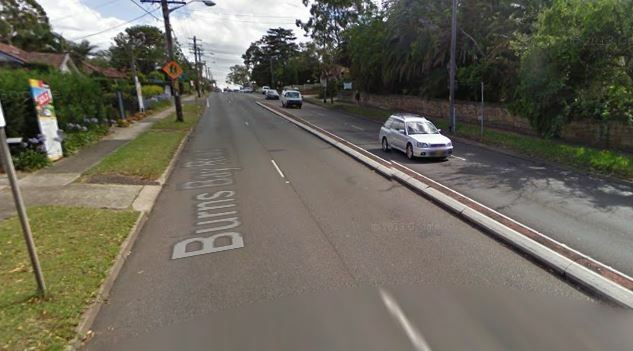 That said, there’s no way a newbie cyclist would ride on it – which I suppose underlines just how bad cycling infrastructure in Sydney is. The final section is through Olympic Park, and then on through Bicentennial Park. This is lovely. 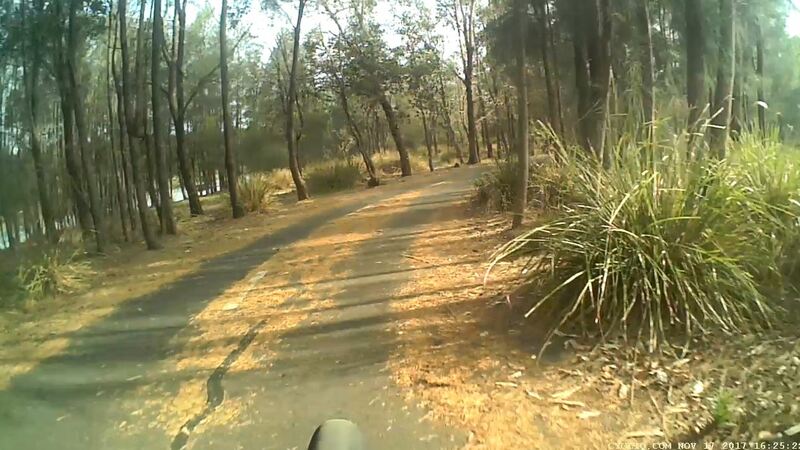 Good cycle lanes to begin, and then a beautiful stretch of off-road path that meanders along Duck River, through the trees and a nature reserve. You can listen to the birds singing, the rustling of animals in the undergrowth and the glint of the sun reflecting off the water as you glide along. Just think if the whole ride was like this. Everyone would be doing it! 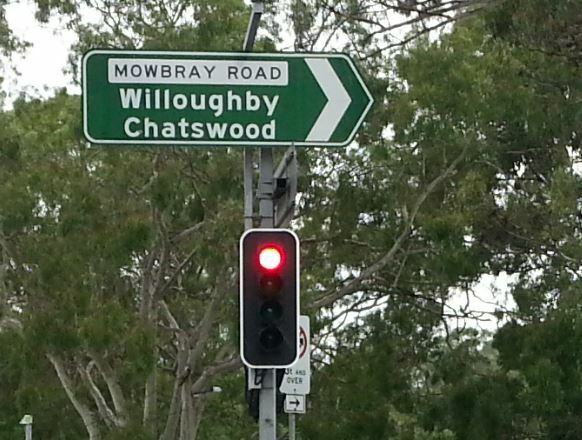 Sydney’s Inner West is usually a quiet kind of place. Little happens to disturb the sounds of single-origin lattes being brewed in hipster cafes, and kids being driven to school in urban tractors. However, yesterday there was a Big Storm. Freak winds hit this otherwise quietly complacent patch of inner-city gentrification, bringing down trees and damaging buildings. Those freak winds probably lasted for no more than fifteen minutes, but it was quite exciting whilst it lasted. It was particularly exciting for me, as I just happened to be on my way home from work at that moment, riding through the heart of the storm. It’s the first time I have literally been stopped in my tracks by the wind – a particularly massive gust just pushed me backwards to a stop. This was coupled with heavy sideways rain that stung my face as I attempted to make progress. However, I was not deterred. I managed to make it home, And, of course, the superiority of the bicycle was one again demonstrated as cars struggled to pick their ways down roads covered with downed trees an other debris, but I was able to continue pretty much as normal. Above is some footage from my rear-facing camera. Unfortunately the battery was flat in the front-facing one, but you can get the idea of the intensity of the wind and rain as it is driven down the roads. It sometimes happens that I end up with two bikes at work. Some inequality in rides too and from caused by side trips, lifts, taxis and business trips conspire to create this imbalance. For the most part I just wait it out, and it usually corrects itself, but the situation had been going on for weeks, and didn’t seem to be resolving. So I went with the rather unwieldy option of strapping the fixie to the Radish. This requires removing the wheels, strapping the frame down via the chain stays, and putting the wheels into the panniers. On this occasion I also had rather a lot of other things to carry, so I had to tuck both wheels into the same pannier, which was not 100% straightforward. Still, I managed, and arrived home without mishap. Or so I thought. When I can to reassemble the fixie, I realised that one of the wheel nuts had gone missing from the front wheel. Damn lawyers. Evidently I had left the nut rather unscrewed, and it had worked loose and dropped off. I effected a temporary fix by ‘borrowing’ one of the nuts from one of the little Chillikebab’s bikes (sadly she doesn’t ride it much; she’s more a dedicated scooter girl), and then set about ordering a new nut. Now, this is when it got unbelievably complicated. Apparently no-one knows what size regular bike wheel nuts are. Attempting to google it yields hundreds of threads in hundreds of bike forums with people asking this exact question, and then receiving as many answers as there are types of nut – both literally and figuratively. I was literally unable to find this out. Hub manufactures don’t put in in the specs. Bike shops don’t tell you (and don’t stock them). Even my LBS was unable to help, trying a few nuts out halfheartedly (none of them fit), and then saying they would have to ‘look into it’. Apparently it could be an M10. Or a 3/8″. It might have 24 or 26 threads per inch, or perhaps a pitch of 1.25, or maybe 1.5. Probably not 1.0, except on some bikes. The front and back hubs might be different. Unless they are the same. And BMX and coaster brakes have different nuts. Sometimes. Or perhaps not. It might be 14mm. Or 15mm. Or M9. Or M9.5. Usually, answers go through a range of options for what it could be, and airily finish with ‘they are all standard, so you’ll have no problem getting one”. Ha! I tried every nut available in Bunnings, and not one of them fit. Finally, I found the answer. Thank you, Moruya Bicycles. Both for having the information, and selling the damn things. 3/8″ with 26 threads per inch. Outside dimensions 15mm. (Which seems weird to me; a non-metric nut that fits a metric spanner). ‘The storm of the Century’. “Stormpocalypse’. These were the headlines after Sydney recently copped some bad weather. 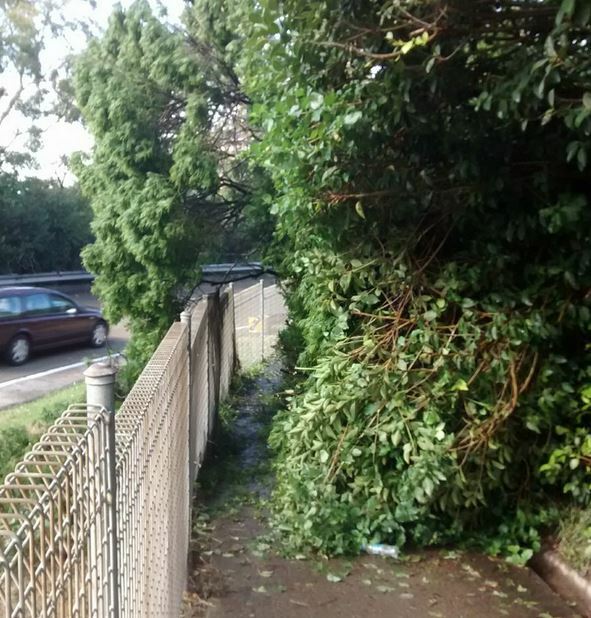 Some areas north of Sydney had some truly appalling weather – with significant flooding, houses washed away, and tragically a number of people died. Things did all get quite exciting when the NSW Premier, Mike Baird, told everyone to go home early to avoid the storm. 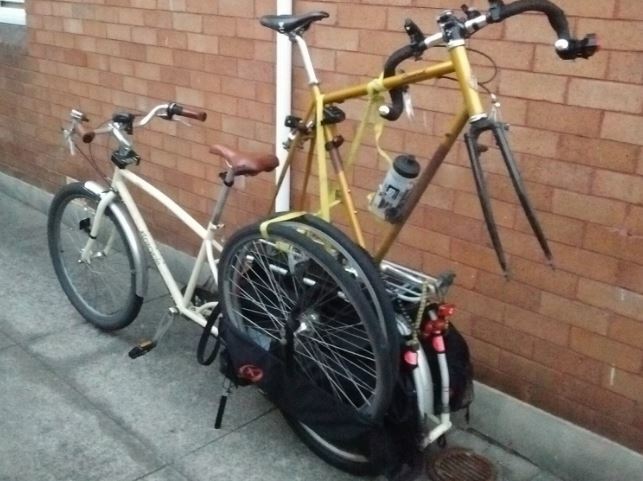 This prompted a mass exodus from our office, and many people offered me a lift, as surely I wasn’t going to ride? The next morning, there was a problem, however. 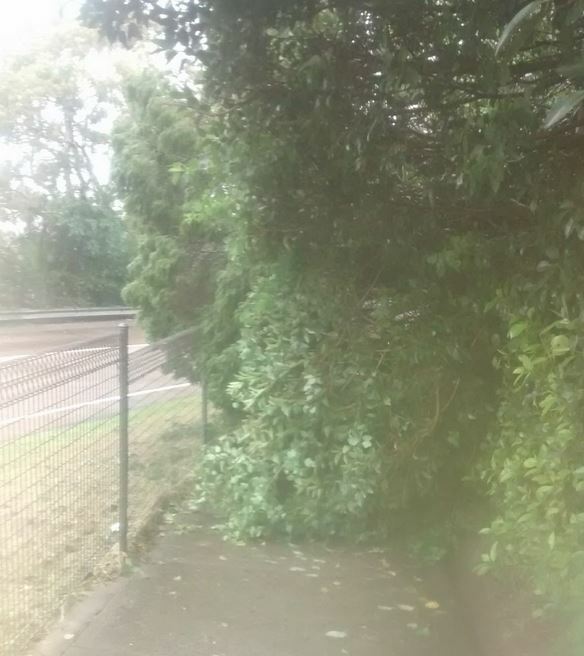 A tree had come down over the path leading to Gladesville Bridge, completely blocking the way. This is the only way to access the path over the bridge, and is a busy commuter route. The steel fence made it rather hard to get round, although I (and several others) managed to lift our bikes over and then climb over ourselves. So the following morning I took a pair of secateurs (I couldn’t fit anything bigger in my bag), with a view to cutting my way through. Cutting through a fallen tree with some small shears is actually rather hard, I discovered, but I am rather stubborn and once I get started I like to finish. So I hacked away at the thick foliage, working the blades round and round each branch until it yielded. After about an hour, I had cleared a small path through. Just as I finished, someone rode through on a mountain bike, barely slowing down. My path was open! Finally, I must tip my hat to this mystery cyclist, whose image has been flashed across the globe as he powers through Sydney floodwaters. 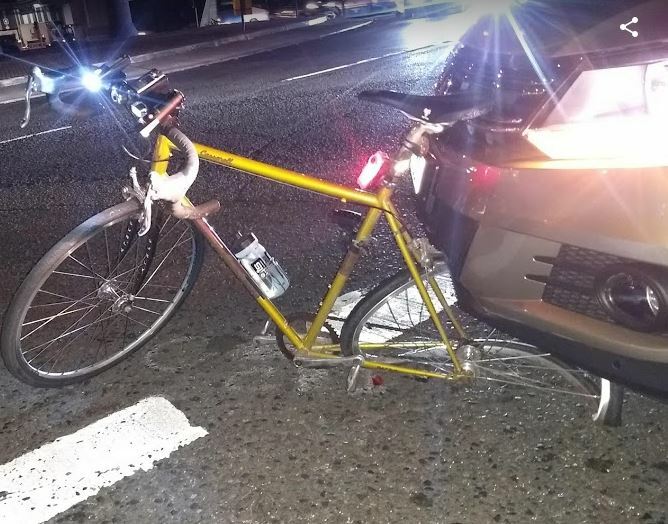 If ever there was a picture that demonstrated the practicality and exuberance of cycling vs the impotent, soulless scourge of the motor vehicle, it is surely this! I had a great experience riding to work the other morning. I was trudging up Burns bay Rd (I’m back on the road at the moment, as the traffic is lighter), and the traffic started to build up somewhat. Behind me was a battered white truck, which I could hear changing gears and grinding behind me. There was a stream of traffic in the RH lane, and he couldn’t get past. So he just stayed behind me, a respectful distance behind, all the way up the hill, with no aggro, no getting closer, no gunning the engine. He followed me like that all the way to the lights at the top of the hill, and as it happened I got across the lights, but they changed just as I went over, and he had to stop. (I was actually quite impressed he did stop, as a lot of motorists seem to think that because they were ‘held up’ buy a bike, they have some sort of moral right to follow me across the lights even if it means they go over on red). He caught up with me again after the lights at Epping Rd. I was in the LH lane, but there was a semi-trailer parked ahead of me. He was coming up behind me in the RH lane, but slowed right down so I could pull out. He then waited until the LH was clear in front of me before going past. 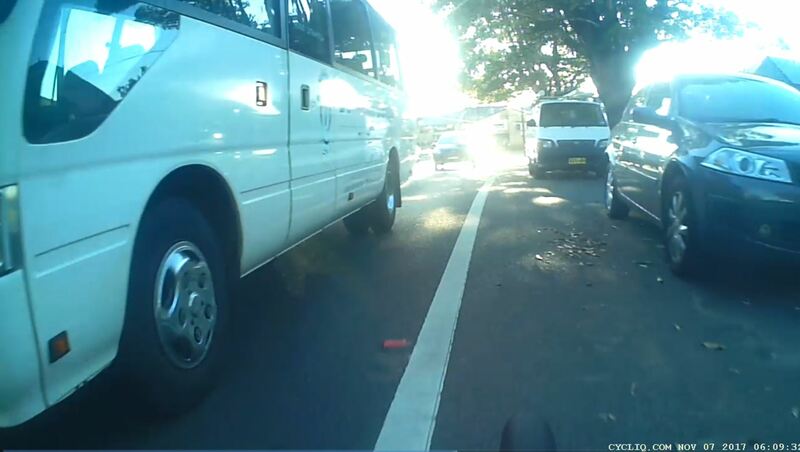 I caught up with him again at the lights at the Pacific Hwy as I was threading through the traffic queue, and he had his window down, so I was able to say thank you. He high-fived me, and laughed and smiled. I guess it’s kind of sad that these experiences are ones I remember, as this should be every interaction with motorists. 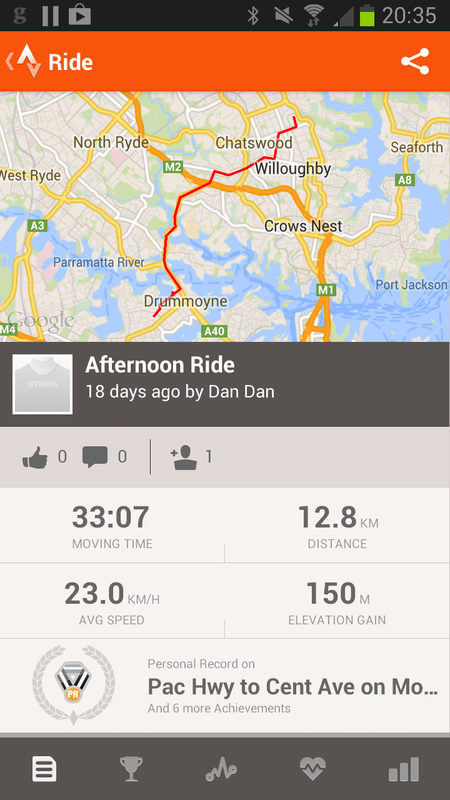 Still, it made a nice change from the abuse I have copped on occasion riding through Chatswood.